Summary: The Sea Turtle Rescue and Rehabilitation Program of The Florida Aquarium Center for Conservation is a historically productive program in Florida that contributes to the reduction of natural and human-induced mortality among wild sea turtle populations. We have successfully rehabilitated 93 of 104 animals since 1999; 87 of these sea turtles have been released again to the wild. When natural and man-made disasters severely impacted sea turtles this past year, the Aquarium worked hard to respond to the dramatic increase in need. In addition to caring for turtles with fishing-related injuries, we took in 27 sea turtles stunned by the cold strike between January and March of 2010 as well as 20 sea turtles impacted by the Deepwater Horizon oil spill this summer. 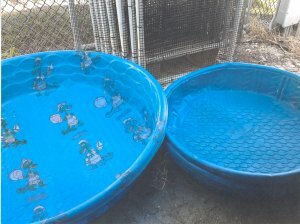 In all, the Sea Turtle Rescue and Rehabilitation program cared for 49 sea turtles and released 47 in 2010, nearly matching the total for all previous years combined. Support from the Sea Turtle Conservancy contributed greatly to the program’s success during this period of high demand, which also highlighted the need for enhancements to our program. To improve and support the services that The Florida Aquarium provides, we will add new lights and improved filtration systems for rehabilitation tanks, and new transportation bins for holding sea turtles in transit.